Categories: Mira Bai, Purandara Dasa, Sri Thyagaraja. 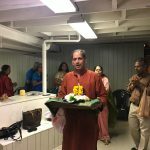 Sri Poornima ji’s satsangs took place in New Jersey from Sept 28 – Oct 1 2017 and was very well received. 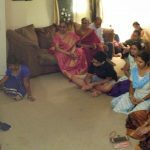 On Thursday, September 28th 2017 Thursday New Jersey GOD members had a wonderful satsang at Edison NJ on “Bhagavata Dharma – A practical path to Happiness” at the residence of Sri.Vijay and Smt.Jayasri. Satsangs started with beautiful rendering of Madhura Gitams led by Smt. Prathibha Ranganathan Ji. Sri Poornima Ji beautifully explained how Bhagavata Dharma has “no eligibility criteria” and also emphasized that liberation in simplistic terms is “to be free from all things that are tying us down” thereby paving a way for being happy always! Around 25 people participated. 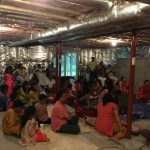 On Friday, September 29th 2017 Satsang at the residence of Sri.Venkat and Smt.Smitha at Princeton/West Windsor went well! The evening program started with a beautiful Carnatic concert by Vipul and Praful Pemmaraju. 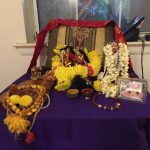 Poornima Ji gave us a glimpse of Purandaradasar’s charitram and showed how “Grace” can turn around someone from being “most miserly” to “most generous”. Poornmaji also drew parallels between Purandarasar’s “kaliyugadhalli” and Tukaram’s “Namacha Bazaar” to show how chanting the divine names uplifts one’s complete ancestry (10 million generations)! 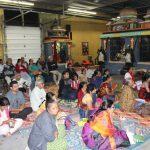 15 people attended the satsang. 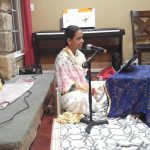 On Saturday, September 30th 2017, satsang at the residence of Sri.Prakash adn Smt.Krithka in West Windsor started with a Veena Duet concert on Thyagarajar’s compositions and Madhura Gitams. Poornima Ji took the bakthas through a soul-stirring journey of Sri.Thyagarajar. 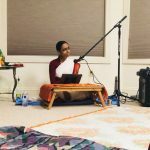 Poornima Ji highlighted the composers Kriti “mAkela vichAramu” to show how bakthas don’t worry about anything in this world as Bhagavan worries about the bakthas! Poornima Ji enlightened the audience on how Thyagarajar “sang what he had attained” as opposed to composing for worldly appreciation! 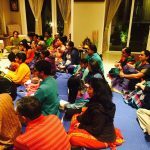 25 people took part in the satsang. 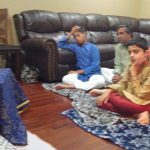 On Sunday, October 1st 2017,satsang in West Windsor started with a Carnatic and Madhura Gitam concert by Sri. Anirudh at the residence of Sri.Bala and Smt.Kripa. Poornima Ji transported the bakthas back to Meera matha’s times! Poornima Ji illustrated that Bhagavan chose Meera to show us all “how one can do bakthi under the most difficult of situations” right in this kaly yuga! Meera’s unflinching love for Giridhari was brought forward through various kirtans. Poornima Ji highlighted Meera’s love for chanting the divine names through “pAyo ji Maime rAAm ratan dhan pAyo” and also how Meera’s anklets consistently chanted “Giridhari”. Around 15 people participated.